With their 50th Anniversary quickly approaching, Woodstock 50 is gearing up for a massive celebration in Watkins Glen, New York from August 16th-18th. Spanning over three days, modern hip-hop, rock, and pop acts are slated to perform alongside bands from the original festival. Fans can catch sets from JAY-Z, Miley Cyrus, Chance the Rapper, Halsey, The Black Keys, and Imagine Dragons as well as epic performances from Santana, Grateful Dead offshoot Dead and Company, Cage the Elephant, Run the Jewels, Courtney Barnett, Vince Staples, Common, Portugal. the Man and more. 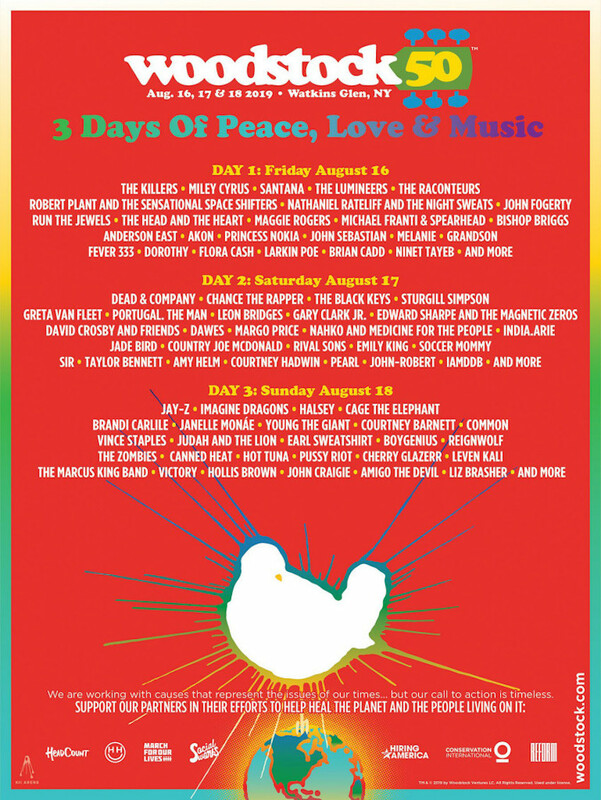 Check out the full lineup below and snag your tickets to Woodstock 50.